Mangaluru: The Bharatiya Janata Party (BJP) candidate for Dakshina Kannada Lok Sabha constituency, Nalin Kumar Kateel will win the MP election with a difference of more than 2 lakh votes, said Member of Legislative Council Kota Srinivas Poojary on Wednesday. All the eight Vidhan Sabha constituencies and 1,861 polling booths, people consider nation first. By voting for Nalin Kumar Kateel, the voters want to ensure that Narendra Modi comes to power once again,” said Poojary. “The BJP, in its election manifesto, has mentioned that it will scrap Article-320. It has also assured to build Ram Mandir without any disharmony. The party is committed to implementing the Uniform Civil Code. It has also announced linking of rivers,” added Poojary. “The Congress-Janata Dal (S) coalition government in Karnataka is not interested in implementing the Centre’s welfare schemes. People in the state are deprived of ‘Ayushman Bharat Yojana’,” he said. “When Anwar Manippady was the chairman of the Karnataka State Minorities Commission, he had submitted a report on Karnataka Wakf Board Land Scam. In the report, it was stated that 27,000 acres of land worth Rs 2.5 Lakh Crore, controlled by the Karnataka Wakf Board, had either been misappropriated or allocated illegally. Who was obstructing the report from being presented in the Assembly?”, he asked. “The Congress party supports traitors of the nation. Their election manifesto is enough proof for this. PM Modi has led a corruption free government for five years and he deserves a second term,” said Poojary and requested people to vote for BJP. 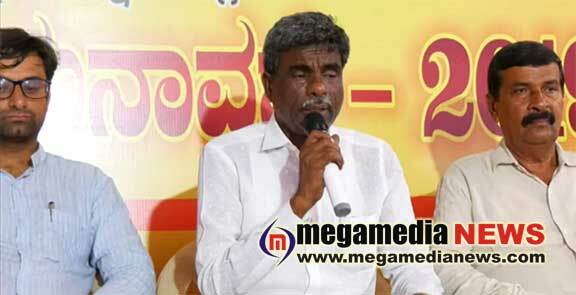 BJP leaders Nithin Kumar, Vikas Puttur and Krishnappa Poojary were present at the press meet.